Plucking gently at the heartstrings of movie-goers and tear-jerker-lovers of all ages, Jon's magical evocation of Ennio Morricone's timeless classic is a delight from first note to last. Capturing the musically-intense spirit of a complex and loving relationship between the old Cinema projectionist and his cheeky young protege, the tune sweeps across the generations and lines the imagination with bitter-sweet infusions of delayed gratification in ways only beautiful melody can. 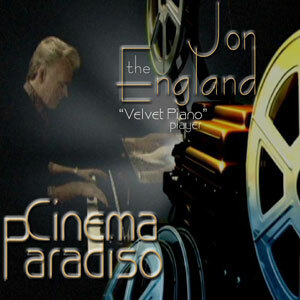 Download the "Cinema Paradiso" theme (sung, by among others, Monica Mancini as "Remember") and enjoy endless moments of reflection and joy in the capable and evocative hands of Jon England, the "Velvet Piano" player as you experience the cinematic style of a master performer playing just for you.